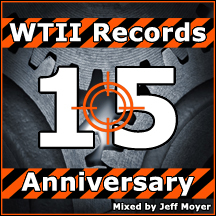 On March 14th, we celebrated the 15th Anniversary of our first release. To recognize this milestone, we gave legendary Chicago DJ Jeff Moyer, the keys to the WTII vault and asked him to make a mix of the labels history. I know it was a tall task to ask. We have covered a lot of styles, genres and sounds over the past decade and a half, but I knew he would be up to the challenge. What Jeff returned was a brilliantly assembled, one hour - thirty-two minute, continuously mixed journey down memory lane. It's been a wild ride and I would like to Thank You for your support throughout the years. Please enjoy this FREE download and if you are ever in Chicago, be sure to check out Jeff. DJ Jeff Moyer has been a staple in the Chicago music scene since 1989. Anyone who has ever set foot in Kaboom, Domeroom, Excaliber, Crobar, Exit, Neo, Slippery Slope and now Debonair should be more than familiar with his work. Jeff has always kept his finger on the pulse of the industrial scene and is truly one of the world's best. To keep up with Jeff's upcoming events, be sure to follow him on Facebook https://www.facebook.com/DJJeffMoyer/.